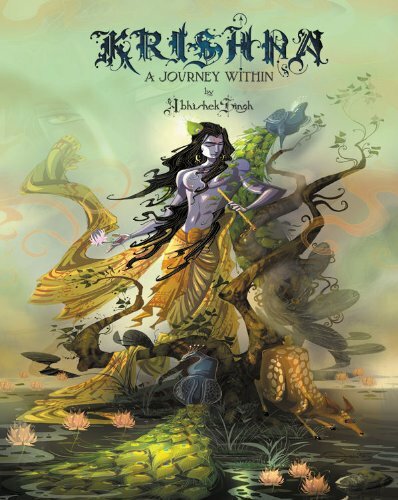 Abhishek Singh's KRISHNA: A Journey Within is a spiritual tale told with artistry. It's visually captivating and I found myself engrossed in reading from beginning to end. I expected stories about deities to be more complicated but the storytelling here flows well, the writing is crisp, and there's a sense of magic attached to the world. It's refreshing to see such a stylistic approach to Hindu mythology. The art is wonderful. I see a strong animation style, with the caricatured characters, occasional anime-style shadows, and the fluidity of the characters. The subject matter, especially religion, is handled tastefully. My only gripe is the paper quality. It's the normal kind you see in comic books or magazines. It's not bad, but it's just normal. For art this good, I was expecting it to be printed on better paper. It's strange but I naturally associate that good art should be printed on good paper, and that was my first thought after seeing the first panel. It's a comic book I can recommend wholeheartedly. A great review and a brilliant book from india ,made my day.The art work mesmerises me and it makes you keep your belief. a true insight into the mind of a great god - Krishna.. a journey from a little boy to being a responsible man. Thanks parka for sharing this rare piece of art, very few indian artist are able to make it up the line.Your review helped lot of people get an insight on this great journey of the artist abhishek singh!! !